The nursing home industry is a powerful lobbyist group — both in Washington and Pennsylvania — that has spent millions to influence favorable government policy. In 2015 alone, the American Health Care Association spent more than $3.7 million in lobbying activity. And in the commonwealth, the Pennsylvania Health Care Association and its subsidiaries have donated more than $500,000 to state and national campaigns since 1998. Skilled nursing care for elderly Americans has been studied for decades in an effort to improve quality and educate the public. The Government Accountability Office, for example, has examined nursing home quality and safety issues since 1998. Numerous congressional hearings have been held. And Congress has passed sweeping reforms that created a resident bill of rights and nursing home sanctions. The problems still persist.Nearly half the nursing homes the federal government reviewed a decade ago cycled in and out of compliance, leading the GAO to conclude efforts to strengthen enforcement has done little to deter the worst offenders.The Pennsylvania attorney general’s office also highlighted this, filing three lawsuits against some of the state’s largest nursing home operators, accusing them of pocketing millions in federal payments but failing to provide basic services.Despite the collective hand-wringing in Washington and Harrisburg, sustainable solutions have been elusive. Yet advocates and researchers contend it is not an insurmountable problem. 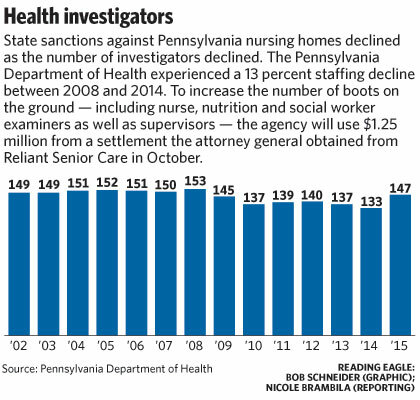 Although no single solution will improve the quality of care, many of the fixes are generally accepted – increased nursing home staff, better enforcement and stiffer penalties.”The regulatory system inherently allows bad things to happen to a vulnerable population,” said David Hoffman, a former assistant U.S. attorney in the Eastern District of Pennsylvania who brought lawsuits against nursing homes in the 1990s.Hoffman added: “It’s very difficult to turn a bad nursing home into a good one. It’s not that difficult to turn a good one into a bad one.”In the past two decades, half of the state’s nursing homes have had serious health and safety issues that resulted in a fine, ban or temporary or revoked license, a Reading Eagle investigation has found.It’s a troubling issue that is only expected to worsen as the nation ages and Pennsylvanians require more skilled care. Federal law requires facilities to provide enough staff to adequately care for residents but does not specify how many is enough. Sufficient nursing home staff is universally recognized as the key to making quality care possible. The U.S. average is four hours and nine minutes per resident daily. More than 40 percent of states, including Pennsylvania, fall below average staffing time for nurses and aides. But the greatest challenge – as Pennsylvania’s own yo-yo enforcement shows – just might be building a coalition strong enough to implement policies that create lasting change. Sufficient nursing home staff is universally recognized as the key to making quality care possible. Although state law addresses this with staff requirements, facilities are rarely cited for failing to meet standards. Pennsylvania established its current standard in 1999, requiring facilities to provide 2.7 hours of care to each resident every day. Patient acuity has since increased significantly, but staffing standards haven’t kept pace.”In 24 hours, all that someone is entitled to get is 2.7 hours of care,” said Matt Yarnell, president of SEIU Healthcare Pennsylvania. “That’s not very much care. If you increase staff, that means better care, less falls, cleaner rooms.”Federal law requires facilities to provide enough staff to adequately care for residents but does not specify how many. Research indicates a minimum staffing of 4.1 hours of direct daily care is needed for each resident. A third of the states – including Pennsylvania – fall short of that.”The big question we have to ask all of ourselves is, what kind of care do we want to give our elders?” Yarnell said.The industry would support increased staffing ratios, but not without also increasing the state’s Medicaid funding, said W. Russ McDaid, CEO of Pennsylvania Health Care Association, which represents 500 long-term care and senior service providers.”The workforce is also the most expensive piece that they have,” McDaid said.Although providing sufficient staff to meet resident needs is a condition to participate in and receive Medicare and Medicaid payments, studies show facilities are rarely cited for staffing deficiencies. Less than 1 percent of the nation’s nursing homes in 2013 received a staffing deficiency, according to a Center for Medicare Advocacy report.Failing to meet and enforce standards of care – including staffing – harms nursing home residents.One in three Medicare beneficiaries in skilled nursing care for a two-week, post-acute stay in 2011 were harmed in some way, according to the U.S. Department of Health and Human Services. The majority required either a prolonged nursing home stay or hospital transfer. Six percent died.This indicates that merely raising outdated staffing requirements is not enough. Oversight agencies also need better enforcement.”Quality issues are just going to continue if there’s no enforcement or such weak enforcement,” Harrington said. Staffing isn’t just a nursing home issue, though. Fewer than 150 health department inspectors, including supervisors, have the daunting task of overseeing the care Pennsylvania’s 700 nursing homes provide 80,000 residents each day. Pennsylvania Department of Health Secretary Karen Murphy has promised more boots on the ground but has not yet determined how many. “One of the easiest and most impactful things the department can do is to revamp its investigative process,” said Sam Brooks, an attorney with Community Legal Services of Philadelphia.Until a spate of new hires in 2015, the number of inspectors had been dropping since 2008. With fewer hands to do the work, the number of state enforcement actions also declined.But advocates warn it’s not enough to hire more surveyors. In 2015, despite increasing staff by more than 10 percent, the state imposed 70 percent fewer sanctions than in 2003.”It’s not just the numbers,” Hoffman said. “If you don’t train and educate all your staff, it’s in effect a meaningless number.”Brooks agreed. He recommends training that follows the blueprint the federal government has already outlined.”No matter what recommendations you make, there’s got to be somebody to enforce it,” Brooks said.Additionally, Pennsylvania’s penalty structure, which has some of the lowest maximums in the nation, hasn’t been revised in nearly four decades. 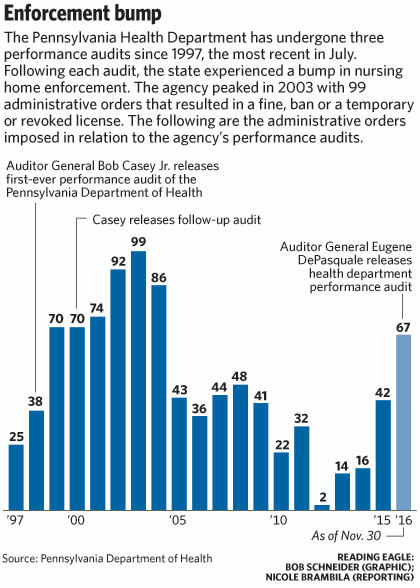 It’s something Auditor General Eugene DePasquale addressed in his July performance review of the health department.State statute permits a fine of up to $500 a day for each deficiency of care, every day the deficiency continues. By contrast, New York and Texas have a $10,000 a day maximum.Any discussion of nursing home reform – researchers and advocates said – should also include financial accountability.The majority of nursing home stays are paid for through Medicaid, the federal social health care program for low-income adults, their children and people with disabilities, which is jointly funded with the states.Most states have a Medicaid reimbursement threshold, but Pennsylvania is an outlier that imposes two caps limiting administrative costs. Medicare reimbursements have no such requirement.An analysis of California nursing home revenues showed facilities increasingly allocated more for administrative costs and profits while shrinking the share allotted for resident care.A possible policy option then could be for both federal programs to have a cap on administrative costs and allocate payments to specific categories rather than the current Medicare practice of an overall rate, which can be spent at the operators’ discretion.Harrington found that if California had had such requirements, the Golden State could have saved $139 million in 2010. When Linda Rhodes took office in 1987 as the Department of Aging secretary, Pennsylvania did not have a law protecting the elderly from abuse and neglect. Mandated by federal law and overseen by the local Area Agency on Aging, ombudsmen investigate nursing home complaints on behalf of consumers. A health department task force report in October made a number of suggestions that reflected the shifting landscape in the nursing home industry, specifically the need for a culture change that emphasizes quality of life care. Murphy, the current health secretary, said she is working on new regulations to address many of these issues but declined to share specifics.”Hopefully with our new regulations, we’ll have a lasting impact on the quality of care in our nursing homes,” Murphy said.State lawmakers such as Sen. Judy Schwank, a Ruscombmanor Township Democrat, said the Eagle had highlighted an issue they would follow in the months to come for possible legislative fixes.But with a projected shortfall of at least $1.7 billion for the state’s coming fiscal year, finding money for continued funding could prove challenging.”When we get to budget season, there’s going to be significant pressure to cut government operations,” said state Sen. Art Haywood, an Abington Democrat serving parts of Montgomery and Philadelphia counties. “Getting more resources or maintaining current resources for the Department of Health is going to be severely tested in the upcoming budget.”More than increased staffing, better agency enforcement and stiffer penalties, real reform requires the public keeping a spotlight on the issue.”You have to keep the state’s feet to the fire, so to speak, and use all the penalties they have at their disposal,” said David Grabowski, a Harvard Medical School health care policy professor and task force member.After finding in a 2000 performance audit the health department was slow to investigate complaints – even life-threatening ones – and deficient in imposing sanctions, the state saw a bump in enforcement actions. In 2002 alone, state investigators issued 140 sanctions. That’s more than were issued in the past five years combined. No one believes the data show nursing homes suddenly improved or worsened. Last year, in the wake of the Golden LivingCenters lawsuit, Murphy called for the first performance audit since U.S. Sen. Bob Casey Jr. conducted a review as auditor general two decades ago. The health department has already doubled the number of sanctions imposed in 2014. Nursing home citations are also up significantly – a healthy sign the agency is looking for and finding areas to improve.But that can change.In the three years after Casey’s audits, the number of sanctions increased each year. But as the light of public scrutiny faded, sanctions sloughed off precipitously. By 2006, six years after Casey’s second audit, sanctions had dropped by half.Without a sustained commitment from lawmakers and the public to keep nursing home care in the forefront, advocates warn that in five or 10 years, the data could again show a bump in enforcement – this time in 2016 – that hastily dropped after the issue of nursing home care fell from the front pages.”Unless there are reforms with long-lasting effect, this will keep reoccurring,” said Brooks, the Philadelphia legal aid attorney. “It can’t get to the point every time that it’s so terrible that something has to be done.”Contact Nicole C. Brambila: 610-371-5044 or nbrambila@readingeagle.com.